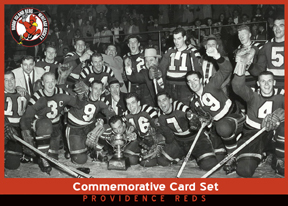 Providence, RI (8/1/2016): A new set of trading cards commemorates the 1955-56 R. I. Reds American Hockey League champions who experienced the greatest minor-league season ever. The 30-card set was produced by the R.I. Reds Heritage Society to commemorate the 60th-year anniversary of that memorable season. The card set was to be unveiled at the non-profit organizations 16th annual Reunion Weekend Aug. 5-7. A working agreement with the New York Rangers of the National Hockey League was the key to the Reds' amazing 1955-56 turn-around. The Reds were stocked with players from that National Hockey League franchise and became a powerhouse that dominated the regular season and playoffs as well as the AHL's individual statistics. Among the leaders of that team was Camille Henry who teamed with Zellio Toppazzini and Paul Larivee on a line that dominated the AHL's scoring stats. Just two seasons earlier Henry had been named the top rookie in the NHL. But he was sent down to Providence and responded by leading the AHL with 50 goals. He added 41 assists and his 91 total points were third best in the league. Toppazzini led the league in points (113) and assists (71) while adding 42 goals. Larivee had 27 goals and 53 assists for 80 points, sixth highest in the league. Also featured among the 21 players in the card set are goaltenders Johnny Bower, the league's most-valuable player that season early in his Halls of Fame career, and Harvey Bennett, the patriarch of one of Rhode Island's foremost hockey families; Bruce Cline, the AHL's rookie of the year that season; popular forwards Jim Bartlett and Ray Ross, and team captain Andy Branigan. Several non-players also are featured including Reds' owner Louis A.R. Pieri, general manager Terry Reardon, coach Jack Crawford, trainer George Army, broadcaster George Patrick Duffy, and Tom McDonough, the team's stick boy who now is founding member of the Society's Board of Directors. Other cards picture the Reds team and the R.I. Auditorium, the Reds' home arena. In keeping with the practice of that era, black-and-white photos are used, with the team's red color on borders and as highlights. Cards may be ordered online at the society's Heritage Shop. The 30-card set features photos of 21 players and others who were critical to the team's success.